The push is on to convince Congress to pass The Amateur Radio Parity Act of 2015 -- H.R. 1301, which was introduced in the US House early this month with bipartisan support and now has 22 cosponsors. The full text of the bill now is available. If approved and signed by President Obama, the measure would direct the FCC to extend its rules relating to reasonable accommodation of Amateur Service communications to private land use restrictions -- also known collectively as "deed covenants, conditions, and restrictions" or CC&Rs. 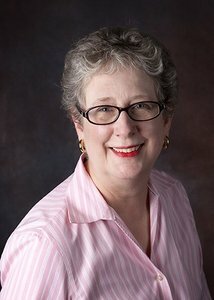 In the March issue of the ARRL Legislative Update, ARRL President Kay Craigie, N3KN, said the bill is "simple and sensible," and she urged all radio amateurs -- whether or not they are affected by CC&Rs -- to join the effort to gain cosponsors for the measure. A regularly updated H.R. 1301 page on the ARRL website includes key "talking points" and other information for Amateur Radio delegations or individuals to use when approaching US House members for their support. ARRL President Kay Craigie, N3KN. "Private land use restrictions that prohibit antennas are growing at an alarming rate all over the country," President Craigie said in stressing the urgency of the current campaign. "This is not just a problem in cities, suburbs, and gated communities. It is everywhere." Part of the problem, she explained, is the uneven application of Amateur Radio antenna regulation from the public to the private sphere. While President Craigie's Virginia county has what she called "a very satisfactory antenna ordinance," similar accommodations do not extend to developments where homeowners associations and private land-use regulations hold sway. "In our rural and small-town county, every new development must have a homeowners association, and they all prohibit antennas with cookie-cutter language," she said. As President Craigie sees it, H.R. 1301 is all about fairness. "H.R. 1301 seeks regulatory parity -- not a blank check, not the heavy hand of the federal government, but simply the opportunity to negotiate reasonable accommodation," she said. "It seeks a level playing field." President Craigie said she successfully reached out to her Member of Congress to support H.R. 1301, and she encouraged other radio amateurs to do the same. "If private land-use restrictions do not affect you, please stand up for your fellow amateurs," she urged. "Please stand up for the youth we all want to attract into Amateur Radio. What is the point of helping youth get their licenses if they cannot go on to develop the skills of Amateur Radio because they cannot have antennas in their neighborhoods?" At present, PRB-1 only applies to state and local zoning laws and ordinances. The FCC has been reluctant to extend the same legal protections to private land-use agreements without direction from Congress. H.R. 1301 has been referred to the House Energy and Commerce Committee. Rep Greg Walden, W7EQI (R-OR), chairs that panel's Communications and Technology Subcommittee, which will consider the measure. When the ARRL Executive Committee (EC) meets on March 21 in Dulles, Virginia -- in the shadow of the nation's capital -- it will confront a raft of FCC-related and regulatory issues. The continued evaluation of strategies for improving the FCC Amateur Radio enforcement program heads the list. The ARRL learned recently that the FCC Enforcement Bureau will recommend to the full Commission significant cutbacks in Field Office sites and personnel, due to tighter budgets. Other topics include a February FCC Notice of Proposed Rule Making and Reconsideration Order (NPRM&RO) in ET Docket 15-26 that could lead to expanded spectrum for various radar applications in the 76-81 GHz band, which Amateur Radio shares with other services. The ARRL plans to file comments in the proceeding. Other matters include a Part 5 Experimental license issued to a Massachusetts company, MITRE Corporation, which plans to conduct experimental transmissions over wide portions of the HF spectrum. The ARRL asked the company in February either to avoid Amateur Radio allocations or to announce the times and frequencies of their transmissions in advance. So far, MITRE has not responded. Among other matters, the EC will discuss strategies to address HF Experimental licenses and Special Temporary Authority (STAs) going forward. The EC will hear an updated status report on the FCC planned adjudication of the 2013 ARRL Petition for Rule Making (RM-11708), asking the FCC to delete the symbol rate limit in §97.307(f) of its Amateur Service rules and to replace it with a maximum data emission occupied bandwidth of 2.8 kHz on frequencies below 29.7 MHz. The committee also will be briefed on the progress of the ARRL's Petition for Rule Making to create a new Amateur Service allocation at 472-479 kHz, as well as other allocation issues, including a possible 135.7-137.8 kHz band and upgrading 1900-2000 kHz to primary. Topping the list of legislative matters is the status of congressional advocacy on behalf of the Amateur Radio Parity Act of 2015 (H.R. 1301) and efforts to obtain a companion bill in the US Senate. The EC will also consider strategies to raise lawmakers' awareness of Amateur Radio during the 114th Congress. 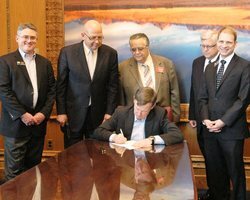 Friday the 13th turned out to be a lucky day for Colorado hams, as Gov John Hickenlooper signed into law an Amateur Radio antenna bill that mirrors the PRB-1 federal pre-emption policy. The signing brings the number of states that have similar Amateur Radio antenna laws in place to 32. The Colorado General Assembly, without amendment, passed Senate Bill 15-041, sponsored by Sen Chris Holbert and Rep Kevin Van Winkle. The new legislation, introduced in early January, specifies that no local government "shall enact or enforce an ordinance or resolution regulating Amateur Radio antennas that fails to conform" with PRB-1's "reasonable accommodation" provisions. "There was absolutely no opposition from anyone at any time for this bill," ARRL Colorado Section Manager Jack Ciaccia, WM0G, enthused. "This was truly a bi-partisan bill, and we had terrific support from both sides of the aisle in both chambers. For junior House member Kevin Van Winkle, this was his first bill ever presented, supported, and passed. He was thrilled to get his first bill-signing pen." The three-part PRB-1 federal policy states that local regulation of Amateur Radio antenna installations be based on health, safety, or aesthetic considerations; be crafted to reasonably accommodate Amateur Radio communications, and represent the minimum practicable regulation to accomplish the legitimate purpose of the local government. Ciaccia said that the testimony of Colorado State Government Liaison Robert Wareham, N0ESQ, offered "an excellent opportunity to sell Amateur Radio and ARES" to the lawmakers. ARRL Colorado Section Manager Jack Ciaccia, WM0G, during a visit to ARRL Headquarters. "[T]he politicians had lots of glowing remarks, because Colorado hams have been very much involved with emergency communications in many of their communities for many years now, during just about every wildfire," Ciaccia said. He pointed out that hams had also impressed Colorado's lawmakers by providing emergency communication during the 2013 flood evacuations in isolated areas. Following the bill signing, Ciaccia recounted, Gov Hickenlooper took another 15 minutes out of a busy day to meet with the ham contingent on hand and to personally thank the Amateur Radio community for its public service role. Wareham aided in getting the legislation drafted and introduced by Sen Holbert and Rep Van Winkle, and he also testified on behalf of the measure while it was being heard in committee. ARRL General Counsel Chris Imlay, W3KD, provided legal expertise and case precedents and consulted directly with Wareham, also an attorney, as the bill made its way through the General Assembly. Ciaccia thanked all Colorado ARRL members and radio amateurs "who provided grassroots support for this legislation." With the telecommunications and electrical power infrastructure in Vanuatu knocked out by the Category 5 Cyclone (hurricane) Pam, which struck the Pacific archipelago over the weekend, no organized emergency communication system has stepped in to fill the gap. Many locations have not been heard from since the storm hit. The extreme storm, with winds in excess of 155 MPH, caused severe damage throughout Vanuatu's 60 islands, devastating many communities, including the capital of Port Vila. The number of deaths is unclear, but the storm displaced thousands of residents, and recovery is expected to take a very long time. There are few Amateur Radio operators in Vanuatu, which has a population of approximately 250,000. Rod Newell, YJ8RN, who lives on Efate Island and is a member of the IARU Region 3 Disaster Communications Committee, has not been heard from since the storm struck. Over the years the idyllic location has been a haven for tourists and DXpeditioners (Vanuatu is number 102 on ClubLog's Most Wanted DXCC List). No communication has been heard from many of Vanuatu's islands, but relief teams and supplies have begun arriving from Australia and elsewhere. Ironically, Vanuatu President Baldwin Lonsdale was in Japan at the UN World Conference on Disaster Risk Reduction when the cyclone struck his country. He made an emotional plea for humanitarian assistance and has since returned to Vanuatu. The BBC has reported that residents of some stricken regions have taken to drinking seawater, since no fresh water is available, and people have been scavenging for food. Drinking salt water can lead to dehydration and death. Formerly known as the New Hebrides, Vanuatu is one of the region's poorest nations. During the UN conference, held in Sendai, International Amateur Radio Union Region 3 (IARU R3) was represented on a panel organized by the International Telecommunication Union Development (ITU-D) Sector. The panel also included delegates from Japan, the Philippines, and Uganda. IARU Region 3 Secretary Ken Yamamoto JA1CJP, explained how Amateur Radio can contribute to Disaster Risk Reduction. He stated that radio amateurs can convey warnings and/or rescue requests in the early phase of a disaster and can provide grassroots communication between evacuation shelters and disaster relief organizations. He said Amateur Radio was a good resource of trained communicators. Nicolas D. Ojeda Jr, the Philippines' Deputy Executive Director, Information and Communications Technology Office, Department of Science and Technology, told the panel that Amateur Radio was very helpful in maintaining communication between communities and disaster relief organizations following Typhoon Haiyan in November 2013. Japan's Vice Minister for Policy Coordination, Ministry of Internal Affairs and Communications Yasuo Sakamoto expressed appreciation for the international cooperation in the aftermath of the 2011 earthquake and tsunami and for mobile phones that provided voice/data communication. Amateur Radio will again be represented at the 2015 National Hurricane Conference, March 30-April 2 in Austin, Texas. The conference theme is improving hurricane preparedness. All Amateur Radio sessions are free and will take place Tuesday, March 31. The primary goal of the National Hurricane Conference is to improve hurricane preparedness, response, recovery, and mitigation in order to save lives and property in the US and in the tropical islands of the Caribbean and the Pacific. The conference also serves as a national forum for federal, state, and local officials to exchange ideas and recommend new policies to improve emergency management. There will be two Amateur Radio-oriented sessions. In the first, from 1:30 until 3:10 PM, National Hurricane Center Director Rick Knabb will discuss the importance of Amateur Radio weather spotter surface reports during severe weather events, Rob Macedo, KD1CY, will explain WX4NHC operations at the National Hurricane Center on behalf of the WX4NHC team, and Bob Robichaud, VE1MBR, will talk about Canadian Hurricane Centre operations. Macedo is Director of Operations for the VoIP Hurricane Net and ARRL ARES Eastern Massachusetts Assistant Section Emergency Coordinator. In the second session, from 3:30 until 5 PM, Hurricane Watch Net Manager Bobby Graves, KB5HAV, will discuss the Hurricane Watch Net, which celebrates its 50th anniversary this year. Macedo will discuss the VoIP Hurricane Net and Hurricane Sandy Operations, followed by a presentation on SKYWARN, an update by ARRL representatives, and a question-and-answer session. 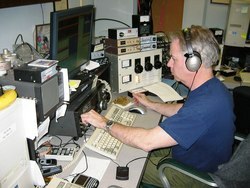 All Amateur Radio presentations will be recorded and streamed live (voipwx.net) (nsradio.org). The Austin Amateur Radio Club will host National Hurricane Conference Amateur Radio presenters that evening, to review the afternoon presentations. South Texas Section Manager Lee Cooper, W5LHC, is coordinating the meeting. The National Hurricane Conference is the nation's forum for education and professional training in hurricane preparedness. Averaging 2000 attendees from around the country, the conference covers all major aspects of hurricane preparedness, response, and recovery. Visit the 2015 National Hurricane Conference website to register and for the complete schedule. Dayton Hamvention 2015 Amateur of the Year Tim Duffy, K3LR. Manager Tim Duffy, K3LR. Hamvention's Special Achievement Award will go to webcaster Tom Medlin, W5KUB, and QRP icon and author The Rev George Dobbs, G3RJV, will receive the Technical Excellence Award. Hamvention will pay tribute to the Orlando Amateur Radio Club (OARC) as Club of the Year. The club sponsors the annual Orlando HamCation®, the second-largest ham radio gathering in the US. 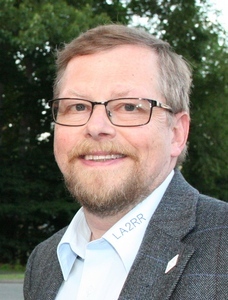 "On behalf of the Dayton Amateur Radio Association (DARA) and Hamvention® 2015, I would like to congratulate this year's award winners," Hamvention® Chairman Jim Tiderman, N8IDS, said. "Their outstanding contributions and many years of devotion to the Amateur Radio Service are recognized and appreciated." The world's largest Amateur Radio gathering, Hamvention is expected to attract more than 25,000 visitors to the greater Dayton area this year. More information is on the Dayton Hamvention website. Read more. The International Amateur Radio Union (IARU) Emergency Telecommunications Guide is now available for download from the IARU website. The guide was developed to provide the IARU member-societies with materials suitable for training radio amateurs to participate in emergencies. It also was designed to provide guidance to individual Amateur Radio operators with little or no experience in handling emergency communications but desire to enhance their ability to participate in such events or to simply have a better understanding of the process. The IARU Administrative Council meeting approved the Guide at its 2014 meeting. "IARU member-societies are encouraged to distribute this guide among its membership and, if necessary, to provide a translation into a language used within their own country," an IARU media release said. "This guide can also be used in conjunction with other training materials by leaders within the emergency communication community to train radio operators in the basic theory and practice of handling emergency communications traffic." The IARU International Secretariat has invited feedback, comments, or suggestions regarding the Guide. The non-profit Foundation for Amateur Radio (FAR) has given individuals another couple of weeks to apply for the 2015-2016 academic year scholarships it administers. The application deadline has been extended to April 15. Individuals and Amateur Radio clubs across the US sponsor these academic awards, and the FAR scholarship application process is open to Amateur Radio licensees worldwide. Applicants must hold a valid Amateur Radio license and be enrolled or accepted for enrollment at an accredited university, college, or technical school. FAR's scholarship program is one of the largest for Amateur Radio licensees in the US. The organization's purpose is to further Amateur Radio in all of its various facets. For the 2015-16 academic year, FAR will administer 67 scholarships worth $125,500 in all. The list includes 36 Quarter Century Wireless Association (QCWA) scholarships worth a total of $77,000 for 2015 (these require a recommendation from a QCWA member). Individual awards range from $500 to $5000. The preferred application method is the electronic form on the FAR website. Information entered on the form goes directly into an encrypted, password-protected PDF file that is available only to the review committee. Raw data are not stored online. Applicants will have an opportunity to print their applications and to edit them. The application cannot be downloaded and completed offline, however. Applicants who are unable or unwilling to use the online application should contact Dave Prestel, W8AJR. FAR may be able to provide an alternate application form. Official or unofficial transcripts may be submitted but are not required; it is preferred that these documents be scanned into PDF files, if they are to be submitted via e-mail. 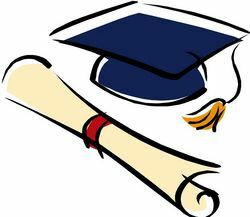 Schools that prefer to mail paper copies should send them to FAR Scholarships, PO Box 911, Columbia, MD 21044. Visit the FAR Scholarship Information page or contact FAR, if you have questions about the 2015 scholarship application process. International Amateur Radio Union (IARU) representatives were in Prague earlier this month to join discussions on the regulatory aspects of orbits and spectrum usage for nanosatellites and picosatellites. On hand for the International Telecommunication Union (ITU) Symposium and Workshop March 2-4 were IARU Vice President Ole Garpestad, LA2RR, and former IARU Region 1 President Hans Blondeel Timmerman, PB2T. In particular, discussions centered on the application of the ITU Radio Regulations. The symposium concluded with the unanimous endorsement of the "Prague Declaration on Small Satellite Regulation and Communication Systems." 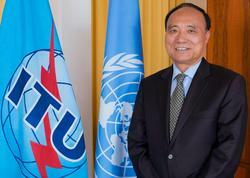 "The symposium provided a unique opportunity for experts to examine the procedures for notifying space networks and consider possible modifications to enable the deployment and operation of small satellites," said ITU Secretary-General Houlin Zhao. "'The Prague Declaration' represents an important step in this direction." The Declaration urges the the small satellite community "to comply with the applicable international and national laws, regulations and procedures, indispensable to guarantee the long-term sustainability of small satellite projects, the avoidance of harmful interference, and proper management of space debris." More than 160 participants from some 40 countries attended the symposium. The gathering is being considered an important step in preparing for the 2015 World Radiocommunication Conference (WRC-15) in Geneva on November 2-27. Delegates discussed challenges facing small satellite development, including aspects related to national and international legal and regulatory issues, frequency management, and radiocommunication standardization. Participants stressed the importance of implementing national regulatory frameworks that clearly define the rights and obligations of all stakeholders, in conformance with international laws, regulations, and procedures established by the UN General Assembly, the United Nations Committee on the Peaceful Uses of Outer Space, and the ITU. These regulatory issues relate to the registration of objects launched into outer space, frequency coordination, and the registration of satellite networks, as well as compliance with the space debris mitigation guidelines. ITU Radiocommunication Bureau Director François Rancy, said the ITU, in partnership with key players, including academe, is addressing newly emerging requirements by various industry sectors to place small communication satellite systems in orbit. "We are examining the regulatory aspects of the use of radio frequency spectrum and satellite orbits to facilitate the launch and operation of a new generation of small satellites," he said. The ARRL Logbook of The World (LoTW) service will be down briefly for maintenance from Monday, March 23 at 2300 UTC until Tuesday, March 24 at 0200 UTC. Also offline during that period will be the Online DXCC Application, the Centennial QSO Party Awards page, and the ARRL E-Store. E-mail to @arrl.org addresses at League Headquarters will be queued for later delivery. The remainder of the ARRL website will not be affected. We apologize for any inconvenience. Vibroplex Purchases Bencher Amateur Radio Product Line: Bencher Inc has announced the sale of its Amateur Radio product line to Vibroplex LLC of Knoxville, Tennessee, owned by Scott Robbins, W4PA. "This sale ends Bencher's presence in the Amateur Radio field, thus allowing the principals, Jere Benedict, President, and Bob Locher, W9KNI, to move towards retirement," the announcement said. Product lines included in the sale include the Bencher BY series of iambic paddles as well as the ST series of single-lever paddles, the Bencher Hex Paddle, the N2DAN Mercury Paddle, and the Bencher RJ series hand keys. The sale also includes the HK-1 Universal Hook-up kit and the YA-1 Low Pass Filter. Vibroplex has agreed to honor the manufacturer's warranties and to provide parts and support, and it will continue offering Bencher products through existing marketing channels. Benedict and Locher expressed "gratitude to the Amateur Radio community for its interest and support since the sale of the first Bencher Amateur Radio products in the early 1970s." Irish Radio Transmitters Society Seeks Award Nominees: The Irish Radio Transmitters Society (IRTS) Awards Committee is seeking nominations for its "Awards for Services to the Society or to Amateur Radio" and "Awards to IRTS members for Other Achievements." Details are available on the IRTS website under the "Awards" section. Nominations should be sent to Awards Manager Jim Holohan EI4HH. Austin Amateur Radio Supply Closes its Doors: Austin Amateur Radio Supply has closed its doors. Started by Johnny Paul, WA5BGO, SK, more than 45 years ago, Austin Amateur Radio Supply had continued to advertise in major Amateur Radio publications. Following Paul's death in late 2013, his family took over the operation of Austin Amateur Radio Supply. Tad Cook, K7RA, Seattle, reports: On Tuesday, March 17, a coronal mass ejection (CME) struck Earth, producing the largest geomagnetic storm of the current solar cycle. Aurora borealis was visible all the way down to the central US. The planetary A index for the day was 117, an incredibly high number. It looks like the greatest impact was in the second half of the day (UTC), when the planetary K index in the four 3-hour periods was 8, 8, 7, and 8. The average daily sunspot number for this week rose from 32 to 59.1, and average daily solar flux declined from 127.8 to 114.8. The latest prediction has solar flux at 115 on March 19, 110 for March 20-21, 105 and 100 for March 22-23, 95 for March 24-25, 105 on March 26, and 110 for March 27-28. Flux values are expected to peak at 120 -- which is not very high -- for April 3-5, and a bottom out at 95 for April 17-18. Predicted planetary A index is expected at 25, 18, and 8 for March 19-21, 20 for March 22-23, 10 on March 24, 5 for March 25-26, then 15, 30, and 25 for March 27-29, then 12, 10, and 8 for March 30 through April 1. This weekly "Solar Update" in The ARRL Letter is a preview of the "Propagation Bulletin" issued each Friday. The latest bulletin and an archive of past propagation bulletins is on the ARRL website. See the ARRL Contest Calendar for more information.